What Did You Do? 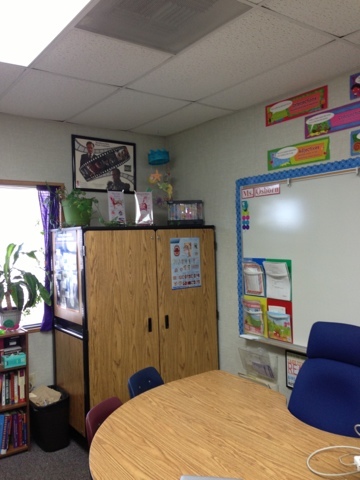 Wednesday-My Speech Room! If you are like me, you are curious about what everyone's space looks like! Today, we are taking a look a my Speech Room (in no particular order)! 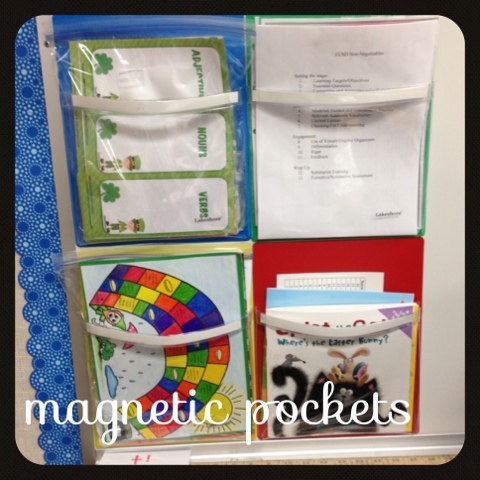 I love these magnetic pocket charts from Lakeshore! I usually put a few TpT materials in the blue one, board games in yellow, books for the week in red and important papers or copies in green. 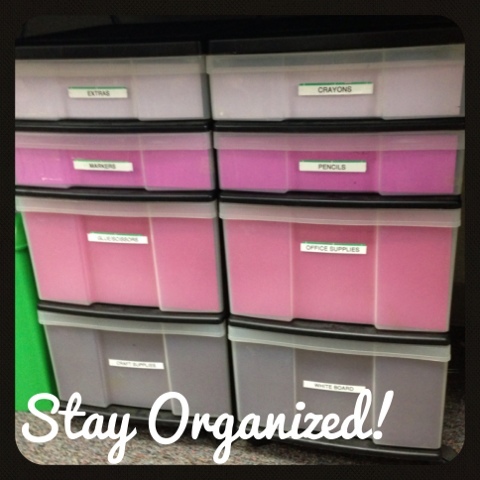 Helps me stay organized and keeps items I need close at hand! 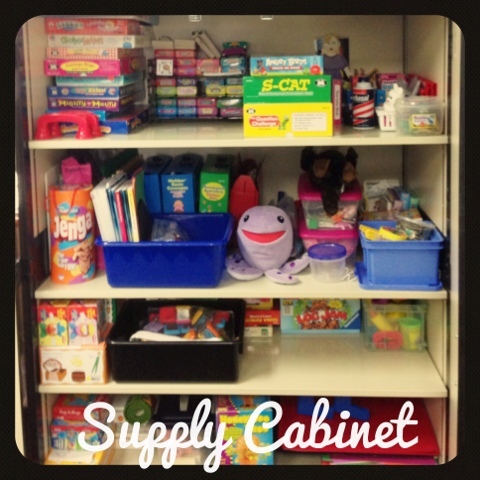 This is my supply cabinet! I keep everything I use often in this cabinet. Mostly games, but I have books and TpT materials in the blue container. All my articulation cards and lots of things you can't even see because it's a deep closet! These are all my office supplies! I recently got inspired by all those people on pinterest who make everything look cute! This keeps the mess in these drawers hidden! I used colored card stock and a paper cutter, took about two minutes to do and looks so nice. I also can't live without my bright green paper shredder! So here is a view of my table, cabinet, and whiteboard. I love my larynx, ear and respiratory systems posters. I also have my lovely Colin Firth poster *swoon* My room has an ocean theme, I made the mobile hanging and the plastic thing is a light up aquarium. My preschoolers love finding "Nemo, Crush, and Dory" when it's on! My blue tape Help Box is my favorite thing in my whole room! Yesterday, Today and Tomorrow's Dates, schedule, sticker time, and some general rules. 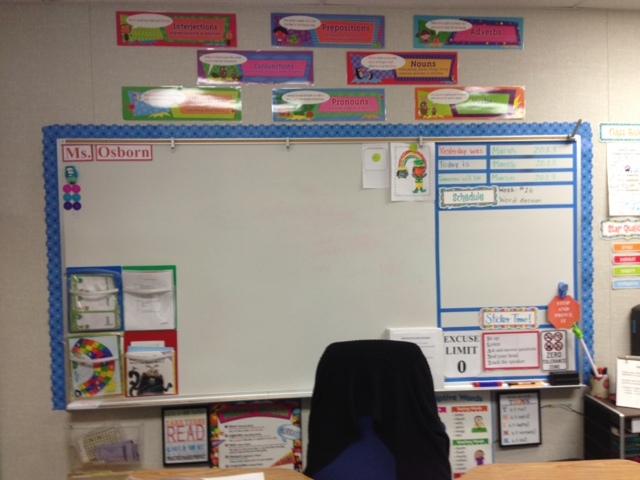 Parts of speech posters, descriptive words and some great posters I found on pinterest are framed under the white board. Cant you see my objective binder to the right? I haven't even printed my updated version yet! I count myself lucky to have a window! I didn't during my student teaching year and I know many of you don't. The window looks at the back of another portable, but at least I get some light! I have three filing cabinets, #1 student files/IEP paperwork, #2 is test protocols, student work, CEUs, parent resources and top drawer is extra stuff (wipes, my purse, bubbles etc), and #3 is now TpT and other handouts/resources! You can also see we have a college theme at our school, I had to adopt a college I did not attend (both mine were taken!) I picked Monterey Bay State as I love Monterey and sea otters are so cute! 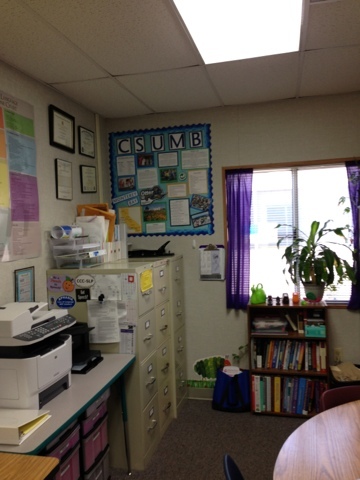 I have lots of Osborn's Otters in my room and we talk to students about being College Bound even in kindergarten! So I have all my credentials, degrees on the wall. Kids LOVE asking me about them and how many years I went to college! Nice room! I love the magnetic pockets, but sadly have nothing magnetic to stick them on! Filing cabinets will hold magnets, but you can also paint a wall with a couple of coats of magnetic paint. You can find it at your local home supply store. If you don't like the open spaces between the rods use cheap adhesive floor tiles to line the bottoms.They cut easily with a box blade or good scissors. Then your smaller items won't fall through.